The first job was to take it to bits, and cut it down to size, then reassemble it. 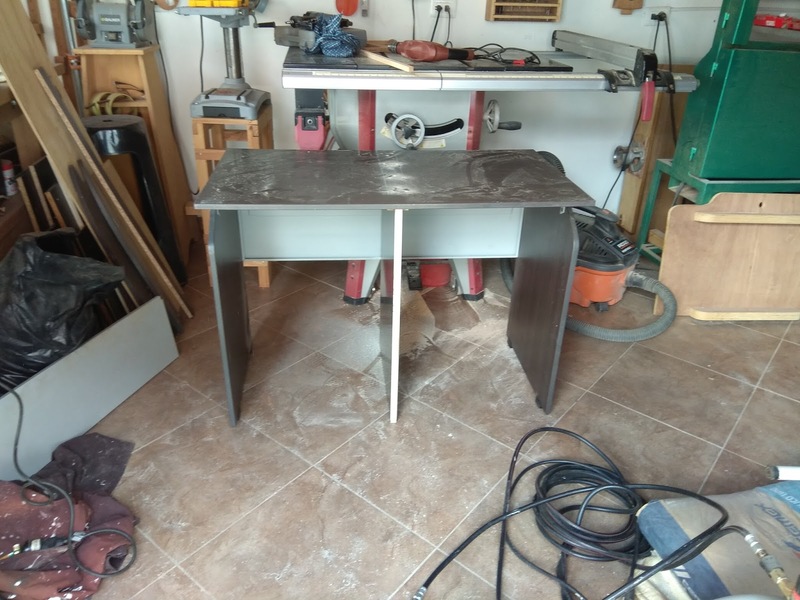 I have decided that this desk, which will house storage for me, will be halved, as the space is 1m wide, so one half will be drawers the other half will be shelves, but to reduce dust, I may well put a door on this side, depending how much plywood is left over. I then screwed down through the top into both strips and the plywood panel, I also screwed through the original metal back brace, into the plywood, and that section, it probably the strongest part of the 'desk'. The next job is to cut and fit the drawer runners and front support, and the shelf supports, this will make the entire structure rigid. That done it was time for some gardening, before finally stopping for a shower and lunch, before going upstairs to do some clerical work, and comfort Tito, during a lightening storm, albeit this time, we did not have much rain, it managed to make the house shake.